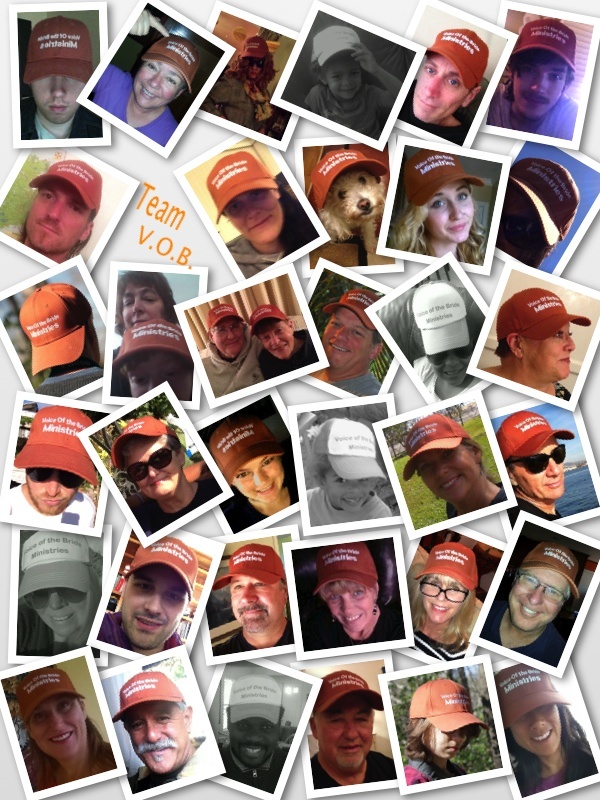 Some of our partners on Facebook participated in “Profile pic wearing your VOB hat” day this past month. “…and everyone who competes in the games exercises self-control in all things.They then do it to receive a perishable wreath, but we an imperishable.”…. I was recently reading in 1st Corinthians, when the above verse caught my eye. It just so happened to be during the Winter Olympics, & I was reminded anew, as I was reading chapter 9, the reference Paul was giving to the Olympic games, which were held during that time. Sporting competitions held great meaning for the people who lived in Corinth, a key city in ancient Greece. The Isthmian games, were held every 2 years in Corinth. They were similar to, but did not quite have the stature of, the Olympic games. In writing the Corinthian people, Paul knew they would understand the analogy he was giving them. If you’ve ever watched the Olympics on TV, you will know the absolutely incredible, unfathomable, extreme dedication it takes to compete in the games. For me (Carol), this has always held a mysterious appeal. When we were growing up, my family avidly watched the Olympics, every 4 years. It had such an impact on me, I even came to the conclusion that I wanted to compete in the equestrian events in the Olympics. I was working towards this, when I came to know Jesus, and my life changed, entirely. And so, as I was reading 1st Cor. 9, I was struck with the incredible comparison Paul was making between an Olympic athlete, and the follower of Christ. He reminds the reader about the supreme dedication it takes. He tells them that they should be following Jesus, just like an Olympic athlete competes to win the gold medal. He says that the athlete ‘exercises self-control in all things’, meaning they sacrifice, train, work toward and choose things that will propel them toward their goal of ‘winning’. He, himself, says he ‘runs’ in such a way, as to have a goal (he isn’t aimless), he ‘boxes’ in such a way, so that he isn’t just hitting at nothing (he has a target). He says, in 2nd Tim. 2:5, if anyone competes as an athlete, they have to compete according to the rules, or they get disqualified. In Hebrews 12:1, he exhorts the reader to ‘run with endurance, the race that is set before us,’ just like Jesus did. Throughout the letters in the New Testament that Paul wrote, he laces in sporting references for people who could grasp the high level of commitment it takes for an Olympic athlete to win. He compares it to how important ‘our’ race is, in that we don’t just receive a crown of leaves (or a gold medal, as the case may be). We receive an eternal reward, and one that doesn’t fade! Sometimes I have moments when I ask myself, ‘what am I doing?’. Maybe you’ve asked yourself the same question. I forget how important this ‘race’ is. Our lives in Christ are of such significance, and the race we run for HIM, is of such value, that it must be attended to with great care & effort, just like an Olympic athlete. Dedication, commitment, follow-thru. As we, VOB, run our race, we appreciate how you are a part of our team, in serving the poor and in worship and prayer. Even as an Olympic athlete could not do what he/she does, without the trainers, nutritionists, sports therapy personnel, coaches, administrators, financial supporters, etc, etc, neither could we do what we do without YOU. An Olympian does not work in a vacuum. Thank you. May the Lord show you, how to run the race He has given, and give you grace and wisdom, in running it. -favor with the customs agents in Tijuana. SO thankful! -abundance of food for those in need. -donation of a car for our ministry partner, Vicente. (thank you K & S, and also, M & H). -a very successful fund raiser last month, which came at a very critical moment for VOB. -please press in for prayer for our health. -monthly supporters for VOB. It’s a bit tight at the moment. -wisdom for expanding P.lace o.f W.orship, our monthly worship/prayer gathering. -more volunteer support with strong physical help for collecting food donations.